In a small saucepan, over medium-low heat, heat cream and butter until hot. Turn heat off, and stir in chocolate until melted. Chill chocolate in the freezer or refrigerator until firm. Roll chocolate into 20 balls and place almonds in the centers of them. 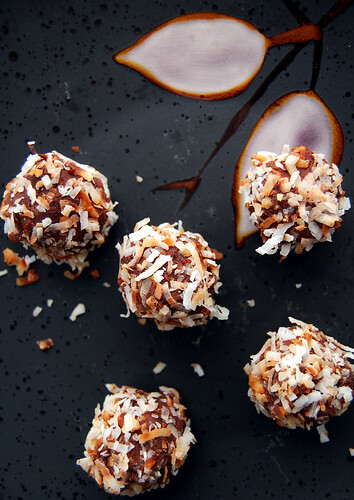 Roll truffles into coconut. 45 comments on "Almond Joy Truffles"
You're right - the best gifts ARE homemade. These would be welcome just about anywhere! Seriously, I would faint if I was presented with a box full of these babies. Man, they look droolworthy!!!! I think you're right, almond joy lovers might be rare.. my mom is one. Not me! I can't stand coconut! ick. My mom would always get the almond joys from our trick-or-treat bags. 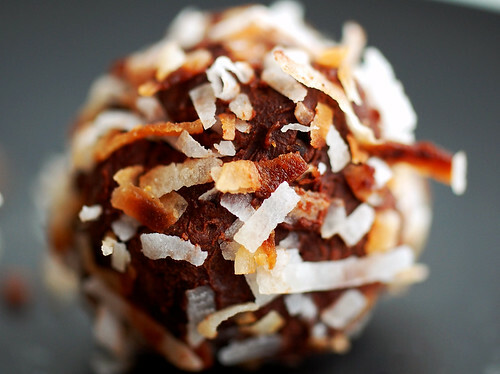 Chocolate and coconut...you can't beat that! Those look so delicious! Have you seen the Almond Joy pieces that are at Target? These truffles look like the perfect Valentine's day treat! My favorite Russell Stover's? I do love the coconut, too! Mmm! Almond and coconut are great, but I always liked the ones that were filled with dark chocolate ganache. My least favorite ones were anything "cherry" filled, aka some artificial pink goo. Gross! These look great! 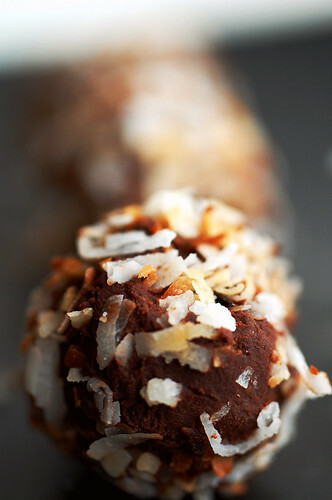 This recipe has inspired me to take a spin on my classic coconut bon bon recipe. 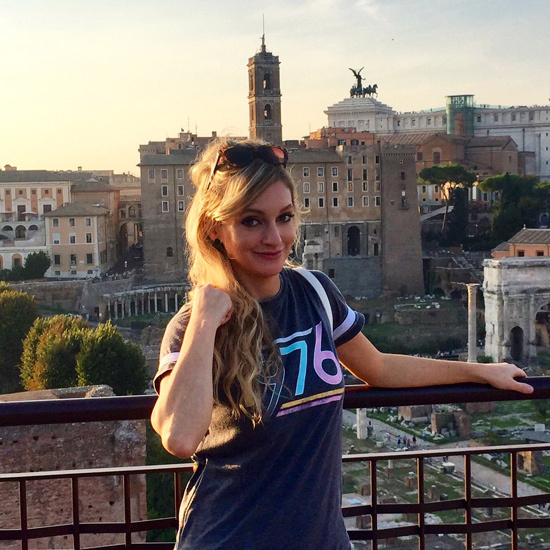 Hope you don't mind;) I love your pictures too. That first shot is really beautiful. BTW my favorite chocolate is hands down the crunchy little toffee bites. Least favorite...the chocolate covered creamy cherry filling...yuck! I LOVE the name of these. Beautiful! Somebody is going to be really lucky to get these. I can never get enough coconut. I don't know why I crave it all the time. So needless to say I love almond joy truffles. Look at those pictures! Omgz! You are so talented. I've always loved almond joys, and mounds! My favorite candies when we got the box of chocolates was the coconut filled one. These sound really good! Fabulous! My hubby LOVES almond joys. Oh, I haven't had a box of those in ages. My mom used to get me a box every V-day. My favorites are the toffee and butter creams. Your truffles look amazing! I think I would like them more than I do the Almond Joy because you used dark chocolate instead of milk chocolate. I LOVE Almond Joys! And your truffles have me drooling! My favorite candy bar is Almond Joy and so is my husband's...these are perfect. I will have to try them! Ericcakes, you are too kind! I think the light diffuser has really helped my pictures. The only problem is, when I use that, I can't use the gold. Any ideas? And no you don't! We're not doing gifts, remember? I love Almond Joys too. I think I'd rather eat these truffles though - less mass produced and more from the heart. I have a soft spot for V-day. It's cheezy, but Kevin and I get so into the winter doldrums that we love having an excuse to do something special and focus on each other. It helps lift our mood till spring. I've always liked Valentine's Day too! What gorgeous unique truffles - yum! Hmm. I'll have to think about a solution to your problem. I bet we can come up with something. I didn't realize you liked Valentine's day so much. Now I feel compelled to fight the crazies at Walgreens to get you a life-sized stuffed bear and a 10 lb bag of conversation hearts. We shall call them heaven balls! Yum! does the chocolate get too hard if you cool them in the fridge? or are they still easy to roll? These look great to make for myself for Valentines Day. I have a boyfriend and all that, but why not spoil myself too? He gets me the fun boxed chocolates! These truffles look awesome, Emily!! perfect valentines gift if you ask me!!! These totally beats a box of chocolates for VDay!!!! yum! I have had coconut on the brain for the past week now! I'll take a homemade gift any day, those are the best, I agree. I love the photo of the truffles, they look so natural! :) Almond joy always brings back memories of my childhood. My favorite truffle? I like the chocolatey ones too, chocolate ganache filled--yummmmm! Eric, yes! A 10 lb. bag of coversation hearts! Jk jk. Anon, you do have to monitor the chocolate to make sure it doesn't harden all of the way. Check on it every 5-10 minutes or so. I posted a coconut treat today too:) Love this one! I made a ton of truffles last year. We were sick for weeks from so much chocolate! My favorite were probably the avocado chocolate truffles. AMAZING!! My favourite is always caramel Emily or maple. When we go into the States we always hunt down Almond Joy because it is just not available here in Canada!! We have that plate! How funny! I love your truffles - they look delicious! Happy valentine's day! 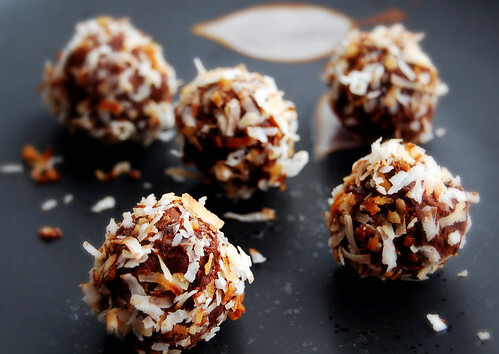 Very yummy truffles with their coconut trim! They are a marvelous Valentine's Day gift. Homemade is always the most appreciated gift you can give. Oh, yeah. I am a big Almond Joy fan. These look fabulous! These may take center stage in my V-day plans!!!! My mom would love these. Growing up I remember her eating Almond Joy bars. Oh, yum. That's all I can say! Chocolate, coconut and almond!!! Yumm! I love truffles.. Yours look delicious! Oh, these look divine! My dad LOVES Almond Joy - probably his most favorite thing. I featured your recipe here. YUM!